"Leaving me here--the only tech-free observer to this illustrious group apathy." One of the (if not the) biggest downsides to the recent explosion of a digital world is humanity's almost inevitable march towards a solitude existence, where we console ourselves in our screens. That may seem a little harsh and overdramatic, but the fact is that as more and more transactions go online, less and less transactions will occur offline. That doesn't mean there still won't be people up to no good and for those people some type of enforcement is necessary, Enforcement such as the constables in Tokyo Ghost #1 from Image Comics. The issue is written by Rick Remender, illustrated by Sean Murphy, colored by Matt Hollingsworth and lettered by Rus Wooton. 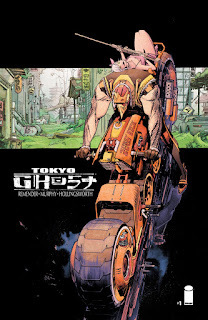 At first glance, it's easy to think that Tokyo Ghosts #1 is some variation of a Judge Dredd story, but there's so much more at play. Remender has made a name for himself as a purveyor of some quality science-fiction stories and his tale of Constables Led Dent and Debbie Decay thrusts the two characters into a world where the consumption of information is about as important as the consumption of air or water. It seems that just about everyone in this LA is plugged in, eschewing normal interaction for the comfort of being immersed in a second-screen experience. Yet while the concept of humanity's obsession with technology seems to be a central theme of the book, Remender also manages to craft a pretty strong first issue rife with dialogue that cuts through the connectivity. Debbie maintains an almost nostalgic love for Led throughout the book--as she seemingly one of the few who's resisted the siren song of an always connected mentality--that humanizes the first issue. The true grittiness of Tokyo Ghost #1 is relayed to the reader courtesy of Murphy's striking and harsh visuals. Present day LA is one of the most crowded metropolitan areas on the planet and Murphy doesn't hesitate to present densely packed panels that simulate the sense of being crowded. What really works though is that despite the thick crowds all plugged in, Murphy illustrates characters such as Debbie cutting through the noise en route to their target, presenting a character to the reader who aren't entirely consumed by information. Murphy's rendering of the world in Tokyo Ghost #1 is extremely strong, as he infuses each panel with so much nuanced detail that further realizes the world to give the reader a better sense of what sort of catastrophe the world really is. Tokyo Ghost #1 is a treatise on the all-consuming nature of a digital world. It finds a place alongside shows like Black Mirror and the second season of Psycho-Pass, inhabiting a world where humanity is so focused on the trappings of digital communications that our obliviousness routinely risks our lives just being outside. Remender certainly isn't shy about his message in Tokyo Ghost #1, bluntly offering a warning that staring at the screen in front of you will make you miss everything happening around you. Murphy's art is gritty and grimy, with scores of citizens being subject to routine carnage, accented by Hollingsworth colors that blend dark blacks and blues with neon pinks. Tokyo Ghost #1 is a great first issue that flows smoothly, giving the reader a reason to maybe look up from the screen every once in a while. Unless you're reading Tokyo Ghost #1 on a tablet, in which case you shouldn't look up until you're done reading. Tokyo Ghost #1 is in stores now.